This Plug and play Decoy Alarm Box features LED back lighting and Strobe tamper effects in a stylish and authentic trans-blue casing. An economical and effective alarm for your property, This sounder offers a number of engineer friendly features including the unique leveling mechanism and modular components for simple installation. This bell box is designed to be used via a 13A socket ran and can be routed through sofit vents or a wall in your home. This enables you to have a convincing decoy alarm box hooked up to mains electricity, with no batteries to worry about. The alarm box comes complete with front and rear tamper protection and in the event of a potential sabotage attack, the 109bBA sounder provides a distinctive audible warning if someone opens the bell box. 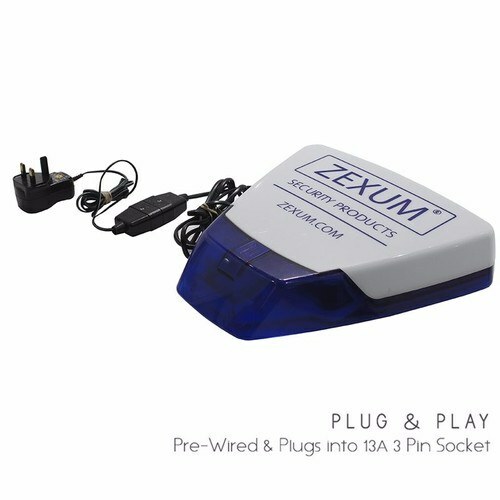 The Cover is labelled with Zexum Security Products branding for deterrence. Hinged cover locks into place so that both hands are free to work on the sounder. 109 dBA sounder. Piezo sounder with high decibel output. Comes with plug adapter to power the bellbox. Great item, easy install once it finally arrived. As well as the cable being of the wrong length could not work out where to plug it in. The instructions with it gave no mention to the cable! Telephoned the company they said they would email me a video clip showing where to plug it in and if I then could work it out they would send a longer cable to me. 5 days went by - do email so sent it back as not fit for purpose.I paid £3.90 for posting back, they only refunded me the £59.99 (the cost) not the extra for me returning it to them. As what was sent was not what I ordered I expected them to refund my postage as well. I also had to chase them as 8 days after returning to them I had not heard anything. They said that they had issued a refund that day! however the man could not confirm the amount, just said it would be back in my account in a couple of days. The £59.99 was but not the postage. So all in all not very happy.